You know it's a sad world when a pen is better than all the Michael Bay Transformers movies combined. 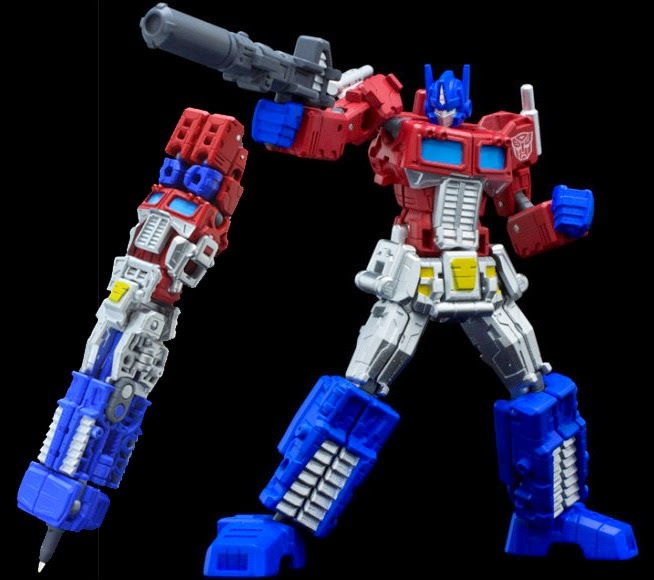 And even sadder when said pen from the shores of Japan costs $35-$45 depending on if you buy the Ultra Magnus, black or iconic colour styles. Is it just me or should the gun be where the nib comes out? That aside, if you can afford a wad of bills for essentially a Bic pen that's more than meets the eye, you might like to know that he isn't called 'Optimus Prime' in the land of the rising sun, he's called 'Convoy', which sounds like a group scene in some horrible Cybertronian prison film. To impress whatever audience you have wherever people still actually write these days, a 'chink, chonk, chunk' transformation to this site will give you all the further info you need. I want someone else to buy this, so I can steal it. I can't believe I saw this on an ad on TradeMe. If they're advertising in N.Z. on our version of eBay they must be putting some money behind this thing. It's very very cool, but the only way I'd ever spend that much money on a pen is for a graduation present. I... I need to change my pants now. Did I mention I'm graduating soon Random? King believe me if there was a Soundwave one, that would be the least I would do. I want it... I might have to waste the money on it... and I'll probably never even use it AS a pen! ...I am sad.